There are so many amazing carrier oils in the world, it’s hard to keep track. Today we’ve decided to highlight 3 carrier oils from Africa that each has multiple uses and excellent attributes. This popular oil, like so many other carrier oils, can be used on the face, body, and hair. It’s a wonderful moisturizer for anywhere on the body and has been steadily growing in popularity since first gaining recognition as a hair oil. Argan oil comes from the nut of the Argan tree—native to Southwest Morocco and parts of Algeria and pressed by hand, often by local Berber women. It’s suitable for oily, dry, and combination skin, with added benefits in minimizing the appearance of fine lines and wrinkles as skin matures. It absorbs easily into skin and most hair and is a wonder at creating and maintaining a youthful glow. A very high quantity of fatty acids, antioxidants, and Vitamin E help to powerfully nourish skin. In terms of hair care, the high content of linoleic acid (which is a lightweight acid) makes it ideal for straight and thin hair. See Marula oil below for a comparison here! Our Argan Oil has been carefully sourced from sustainable and fair Moroccan farms that pay workers well and give back to local communities. 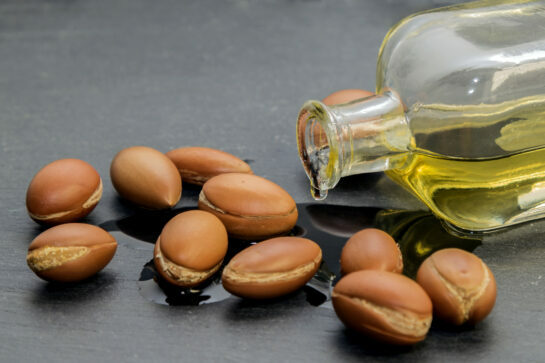 Argan’s surge in popularity has meant that occasionally it is over-harvested and unfairly produced, but Essential has worked hard to find the best producer possible. We have also chosen to use a USDA Certified Organic oil, so you know exactly what goes into every bottle. We encourage you to try it out by using a few drops on your face, incorporating it into your skincare, or applying as a leave-in oil for dry hair. Jumping south towards the southern portion of Africa, in a mix of woodlands broadly referred to as Miombo Woodlands, you can find the Marula tree. Like Argan, Marula is harvested from the nuts of its tree and pressed to create an excellent skin and hair oil. Marula Oil is slightly newer to the market in terms of broad awareness, but its qualities and anti-aging benefits help it stand out from the crowd. The oil is close to skin’s natural oil composition, and it absorbs quickly to more easily deliver an impressive amount of antioxidants and essential fatty acids. It also contains good amounts of Vitamins C and E, in addition to flavonoids, so this oil does double duty in hydration and nourishment. It also has a very high content of Oleic Acid, which is a heavyweight acid, making it more suited for curly and thick hair types. Although anyone can use it, we like it best when fighting frizz and adding heavy shine. We often hear people asking for oil-free or non-oil-based products when they have oily skin themselves, however, this oil absorbs quickly and does not leave a greasy feeling. It’s suitable for oily skin in the manner it hydrates, and should have positive long-term effects on oily skin. Marula is also great as an addition to other products like shampoos, conditioners, or even foundations. The Kalahari Melon is an ancestor of the common and delicious watermelon we know in the rest of the world, but with a light pale yellow fruit that mimics the color of the seed oil. The seeds are cold pressed, producing a very fast absorbing virgin oil that is also high in fatty acids. Like the other oils on this list, Kalahari Melon oil is great for the face, body, and hair. It’s often used in hair masks and entire lines to bring extra moisture and shine to hair, and it could easily be added to conditioners or used on its own as a leave-in product. Because of its fast absorption, it doesn’t feel greasy, promoting its use in scalp and hair care. In terms of skincare, its high content of Omega 6 Fatty Acids nourishes and rejuvenate, rivaling well-loved Evening Primrose Oil. The high content of antioxidants and Vitamins A, C, and E mean that skin stays healthy and toned, even as it matures. This oil, like the others, is great on its own, added to your favorite moisturizer, as an oil cleanser, in conditioners, and many other applications. It’s also newest to the skincare market, so now may be the time to both sell and add Kalahari Melon Oil to your own line of products. Let us know which oil you prefer or would most like to try! We always love hearing how you use particular products—face? Body? Hair? Cuticles?